As a pilot I was wowed by the Icon A5. This “light sport aircraft” is the ultimate toy for pilots who enjoy the water. Imagine launching this puppy from your yacht like a jet ski! Read more about this ingenious development in aviation in Wired Magazine. I always try to avoid seeing any components that drive the media in any room. In this Family Room / Theater. We used two 65″ Panasonic Professional Plasma monitors, the same used by NASA! Tucked away in the “Media Closet” is a stack of equipment to run Cox HD Digital Cable, DVD, and Apple T.V. Two Monitors works great whether you watching the game on one monitor and a Sleepless in Seattle just downloaded from the internet. With Apple T.V. you can edit and create great slide shows. The parallel activity not only looks cool, it is a fantastic way to expand the functionality of this room. By the way the lighting and Drapery are controlled from the Phillips Pronto Universal Remote Control. In this Master Bedroom we created a custom installation for the Panasonic Profesional Plasma Monitor and installed it behind a specialized mirror and created a custom silver leaf frame around the whole ensemble over walls that are upholstered with Calvin Fabrics linen. The mirror glass is very expensive as were the custom picture frames..so yes, we installed two mirrors, one for the T.V. and the other mirror simply to match because of the symmetrical arrangement of the dressers. We did the same installation in a sitting room off the Master Bath. I’m craving Salmon and scrambled eggs this morning! Check out this beautiful presentation of a Silver Salmon we caught in Alaska this summer at Winter Lake Lodge. The very talented chef new we were leaving the next morning so she prepared our big Silver for breakfast. She presented the fish on a platter with salmon mouse AND individual servings of Salmon Hash with scrambled eggs and spinach. I thought it was brilliant to make a visual presentation of our gorgeous fish and separately prepare each serving. Talk about a visual feast for the Table! 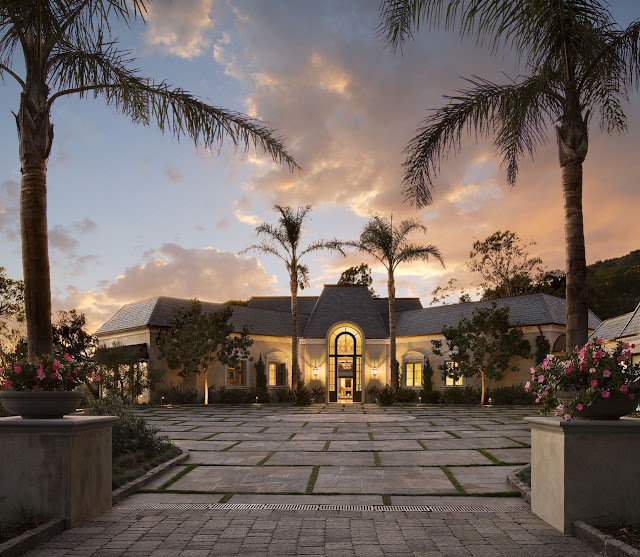 We meticulously restored and rebuilt this John Elgin Woolf estate in Montecito. The home was originally designed and built in 1959 for the Huntington family and was teh scene of many Hollywood parties when the estate was purchased by Joan Cohn Harvey. In rebuilding the property we completely respected the glamourous era into which the house was originally built. The modernity of the mid-century was blended with the technology of the 21st century, resulting in an unparalleled sophistication. John Woolf was the creator of the Hollywood Regency Style and had who’s who in the film industry client list 1930’s-1960’s. Capturing the essence of “Wow” in all they do, John Maienza and Gregg Wilson are globe trotting architects, designers and decorators. They are creators of lifestyles and environments that capture the essence of “WOW”. Mr. Maienza is a registered Architect and Interior Designer. He holds a Master’s Degree in Architecture and Bachelor of Arts (Art History) both from Tulane University. Mr. Wilson holds a Bachelor of Science from Pepperdine, and has a decades long career in construction and management. The “brand” in design is simply the best. Their collaborative work has been widely published Internationally. Currently, John and Gregg are working on a production for television about design and lifestyle through their production company WowBoyz Media. This professional's portfolio was voted most popular by the Houzz community.